Four decades, and one year ago today, my Dad celebrated (in excess, I understand) the birth of his first daughter. Oh, how I wish he was here to celebrate with me today and to see what I’ve become. ***the cupcake is from an apron I made for last year’s Cupcake Swap. Cute, huh?! Happy birthday, Doris! Do whatever you want all day long. Happy Birthday Doris! I can't think of one thing that is NOT fabulous about being in your forties. Have a fabulous day and an even better year! And sew your brains out often! Happy Birthday – we share a birthday. I am spending mine sewing too and dinner out tonight. my computer shows both depending on if I am reading in my reader or at your site? 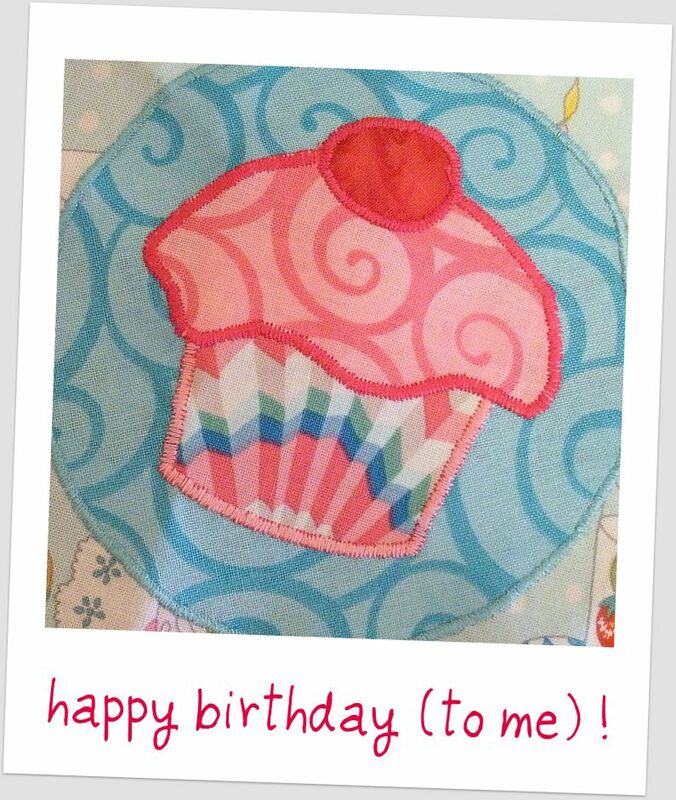 your cupcake is sweet and here is to a sweet birthday. Happy birthday. May the year ahead be filled with happiness. Happy Birthday blessings, we share the date! Although, I've had a'hold of the date just a little bit longer, lol Cute cupcake!! Happy birthday to you! Mine was yesterday, and I found a few minutes to baste a quilt. I hope you enjoy a perfect day! And thanks, by the way, for visiting my blog. It was nice of you to stop by. Happy Birthday! Hope you've had a wonderful, fun, relaxing birthday! Happy Birthday Doris…..and I recognised that cupcake straight away…I see it every day on my apron…..how lucky am I! Hope you have a wonderful day. Happy birthday. Sounds like the best way to spend your day!! Happy Belated! Love the apron. Its cute. If you get a chance, check out my blog. I would love some feedback. Just chiming in here also to add my “Happy Birthday” wishes! Happy Birthday!! I hope it was wonderful. Happy birthday to you! What a great day to celebrate. Hope you were spoiled with lots of sewing time! Very cute cupcake! Happy Birthday Doris!! Hope it was a good one. Happy Belated Birthday Doris!!!! Hope you had an awesome day!!!! Love your birthday story with your Dad…very sweet.